Converting women's shoe sizes to men's is simple: Just subtract 1.5 from the size, as long as you're using U.S. measurements. To make sure the shoe fits, however, you'll want to consider a few other key factors before you look at the size conversion chart. First, have you had your feet measured in the past year? Shoe sizes change over time, even for adults. Shoe sizes in general are getting bigger -- the average has increased by two sizes since the 1970s, according to one study -- and according to another study, about half of women don't wear the right size. Next time you're out shopping, step up in the shoe department and measure your foot in a Brannock device, the metal foot-shaped instrument that measures both length and width. That will give you a starting point as you look at size conversion charts. To use a conversion chart, find your size under women's shoes, and then look at the equivalent for men's sizes. It works the same in reverse, of course. Any women's size has as an equivalent men's size that's a lesser value of 1.5. 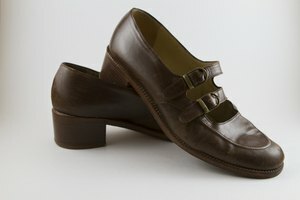 Meaning, if you wear a 7.5 in women's shoes, the men's size would be a 5. Conversely, a men's size 9 is a women's 10.5. Width can be a big factor in comfort. Shoe width is measured from AA (the narrowest) to EEE -- or even more E's. A women's medium, however, is a B, while a men's medium is a D. A "medium" width in a men's shoe size, therefore, may be too wide for many women, so keep that factor in mind. Shoemakers use two different scales for shoe sizing in the United States: the Footwear Industries of America, and the Common Scale. The latter is most often used; the Common Scale uses men's sizes that are 1.5 greater than women's. The FIA, also called "Standard," has only a difference of 1 between men's and women's sizes. You can do a little research and tell which scale the shoe manufacturer uses. Shoe retailers sometimes have information with brand-specific charts. Online retailers offer other measuring options, too, such as Shoefitr, which has 3-D imaging that shows how a specific shoe will fit. Best bet for comfort: Try the shoes on for size, and treat your feet to a well-fitting pair -- whether in men's or women's size. What Are the Differences Between Sizes 22 and 3X?